Retreaver can create Engagements in HubSpot each time a call is received, which have information about the call including recording, duration, etc. These engagements are associated with a HubSpot Owner or salesperson. This allows you to treat callers who are already in your HubSpot account specially, for instance, routing known callers directly to their HubSpot Owner or salesperson. Click the Settings cog in the main menu in HubSpot. Click "Properties" in the left-hand menu. Type "Owner" in the search bar under "Contact properties". Hover over "Contact owner" and click "View". At the bottom of the next page, your HubSpot Owner IDs are listed in the "Dropdown options" table in the "Internal Value" column. Set your Call Endpoint in Retreaver to have the same ID and we'll automatically create a HubSpot engagement for each call to that Call Endpoint. 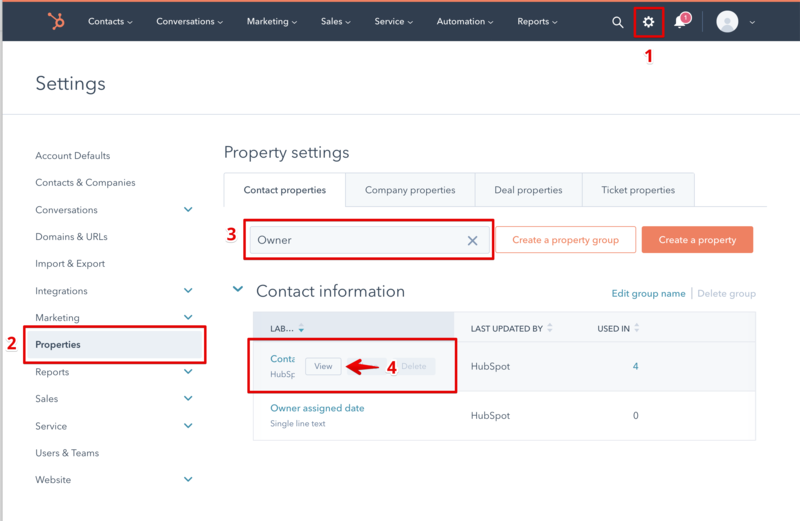 You can set a default HubSpot Owner to be used when an unknown caller calls in and is routed to a Call Endpoint that isn't associated with any specific salesperson, like your call center's main line. We suggest setting up a "Retreaver" or "Bot" user in HubSpot, and setting the default Owner ID on your Retreaver Integration.